Just as with blades, orthopedic drill set is equally important and ought to be smooth working during surgery, giving utmost concentration and control to the surgeons. The orthopedic drill with battery operated facility works wonders, for the surgeons experience better efficiency while treating as the operation is going on. Orthopedic drill set is a surgical drilling system that simply does away with the troubles of air drills used in surgeries before. Apart from giving better control are also time saving these orthopedic drill set. Operation effectiveness is augmented and time is saved that result in better control on part of the surgeons and even a lot of respite from the pain with usage of an orthopedic drill set in patients usually. They are much better stabilized, offer a lot of control with which the surgery may be performed and modern or sophisticated in nature. Made of a high end material, orthopedic drill set which also come battery operated become even more efficient and mobile while dealing with the problems of fatigue that ends up tiring hands of the surgeon even as the surgical drill set give better mobility to the surgeons and much less stress to the patient upon whom surgery is being performed. Thus authorities opt for someone like Orthopedic- Implants.Net while choosing an able manufacturer. 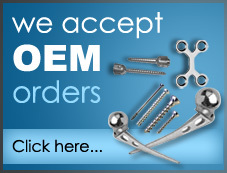 An array of orthopedic and surgical equipments are available at the reputed D4 Surgicals India Pvt. Ltd owned division, that are not only manufacturer but also leading supplier and exporter of these instruments. Electric Drill / Saw / Reamer System and Drill Hand piece are the parts of the battery operated orthopedic drill system. Ensuing utmost brand quality and efficiency in working, they help the surgeons with better results these orthopedic drill sets. We are leading manufacturer, supplier and exporter of battery operated drilling system like saw blades, reamer system, orthopedic drill set, drill handpiece, and other orthopedic devices.